296 pages | 50 B/W Illus. It has recently become apparent that "quality" is quickly becoming the single most important factor for success and growth in business. Companies achieving higher quality in their products through effective quality improvement programs enjoy a significant competitive advantage. It is, therefore, essential for engineers responsible for design, development, and manufacture of products to understand the concepts and techniques of quality control. Statistical Quality Control imparts that understanding. Covering the basic steps in quality assurance and control methodologies, this unique text not only sequences, but also integrates the various techniques presented. The chapters, which include Optimum Process Means and Process Setting, are arranged in logical order. 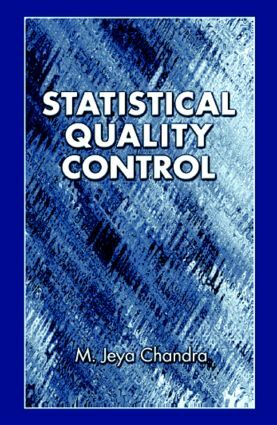 This advanced treatment makes Statistical Quality Control an ideal graduate text as well as a reference for practitioners working in design and quality control. "… A broad spectrum of topics is covered, some of which are rather unique (e.g. optimum process level in Chapter 6 and process setting in Chapter 7) in the sense that they motivate the reader to pursue further research in those areas … Overall, I believe that Statistical Quality Control will serve the needs of a one-semester graduate course in engineering."